Thanks to Ed Butler for sending this (recently scanned) advertisement from the In Dublin magazine showcasing the 1978 Belfield Fringe Festival. What a line up! Peter Henry, who writes the Old Trinity column in Trinity News, has kindly passed me on a scan of an article about UCD student politics from 1967. The article deals with the Fianna Fail, Fine Gael (including a feature on Vincent Browne) and Labour Party UCD branches. You can read some of Henry’s articles on Trinity College here. ‘Instead’, was a “left wing Oz look alike” magazine that was published in Belfied in the early 1970s. Aidan Magill, who read science at Belfield from 1968-72 and was involved with ‘Instead’, has kindly sent on a full issue of the paper and jotted down some of his memories of the magazine’s production. I seem to remember we produced an issue about every two weeks and basically spent the entire Sunday through to the early hours locked in the Arts Block to do it. The entire place closed on a Sunday so we had to get let in by the Porters and had to get let out a certain times for food. It was quite a party atmosphere though we had to ban the smoking of dope as we made too many mistakes and didn’t get any work done. You can read the full issue here. Section from the front page of Instead, Vol. 1 No. 3. Pittion began studying French and Linguistics in UCD in 1985 as part of an Arts Degree. He became involved in the UCD Students Union (UCDSU) early on, being elected as a class representitive and joining the Ents Committee. He admits that facilities in Belfield at the time “weren’t really bad” but there was always an underlying feeling that students had to “get the degree and emigrate”. As there were no jobs going, students had the choice of either leaving the country or “stay and party”. Pittion chose the latter. Francois. 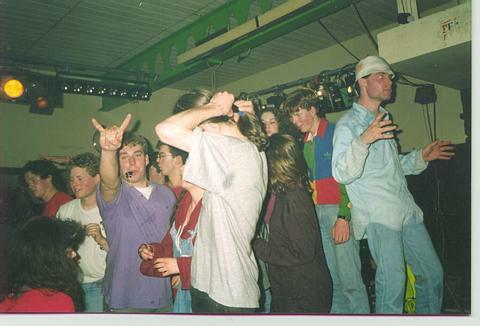 UCD Student Bar, Late 80s. 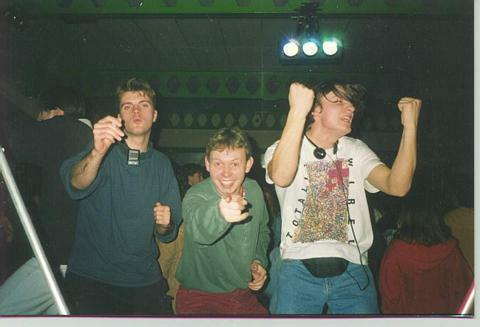 Up until then, there was no (electronic) dance scene in Belfield (or Dublin for that matter). The highlight of the week on campus was the disco in the Student Bar on a Saturday night. The DJ was Dave Lowe a.k.a Bambi who played “all sorts” Pittion remembers. He admits that cheap pints of beer during an extended Happy Hour were the main attraction for most students. After a couple of years in the Ents committee, Pittion ran for Ents officer in 1987. The elections were hotly contested and he came up against the Kevin Barry Cumann i.e. the “Fianna Fail machine”. Fortunately, due to his contacts in Agricultural Science and Science, Pittion won by 260 votes. Soon after his victory, Pittion and a close friend Mick Heaney began organising nights in the bar on Fridays “as an alternative to the Saturday disco”. The Friday nights, soon to be known as the ‘Unlimited Freak Out’ (UFO), would go down in Belfield campus infamy. UCD Student Bar - UFO. The UFO nights really took off. Pittion remembers that “the place would be packed by 8, and crazy by 11”. Due to this success, Pittion and Heaney had the idea of continuing the club after the UCD bar shut by running buses from UCD into The Rock Garden (until recently known as Eamon Doran’s) where the fun continued well into the early hours. When questioned about drugs and the rave scene in UCD, Pittion is honest. He admits that the UCD authorities had no idea that every Friday night “half the bar was mashed on speed, acid and mushrooms”. The barmen knew what was going on, he says, but they turned a blind eye. 'Bray Mafia' -Barney Davy, F & Gary. UCD Student Bar. 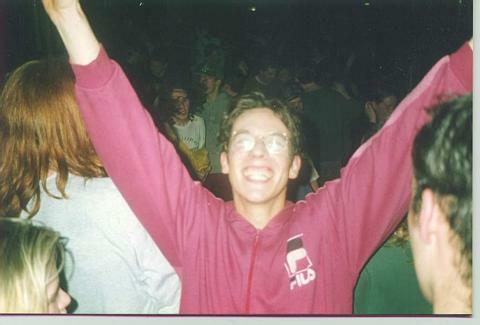 Though always associated with the rave scene, Ecstasy was not a popular drug during the late 1980s in UCD. It was too expensive. At the time, a single tablet of ecstasy could set you back £20-25. 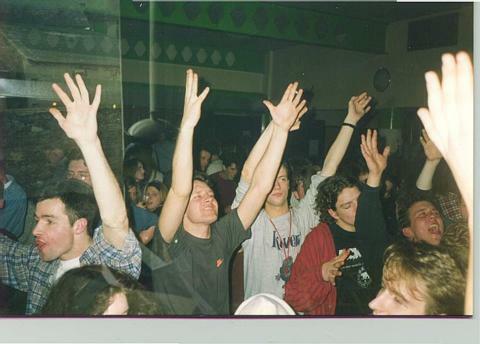 The widespread use of the drug in the rave scene didn’t come into play until the prices dropped in the early 1990s. 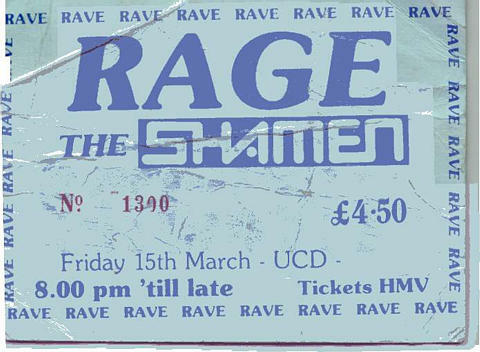 Pittion’s personal high point (“no pun intended!”) during his time in UCD was convincing Mark Collins (Ents Officer 1990/91) to put on The Shamen, the Scottish electronic band, at the 1991 Rag Ball. Well after graduating, Pittion was still asked to come back to Belfield to DJ the big Rag and Fresher Balls; he did this up to 1993. The Shamen. 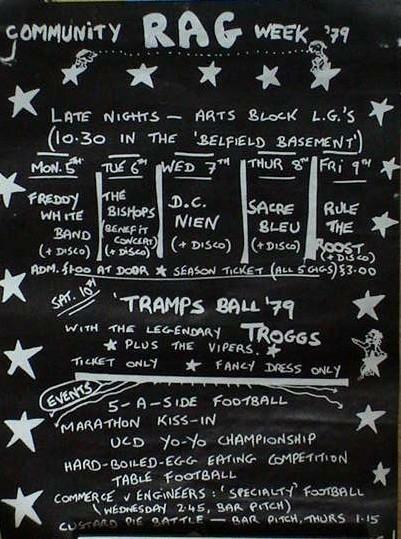 UCD Rag Ball 1991. 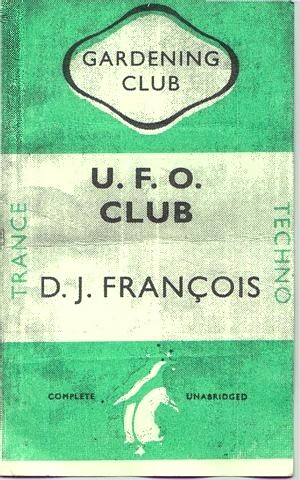 Francois ran the UFO/Alien nights until 1997. From there he moved onto a Friday night residency in The Kitchen (which was based in The Clarence Hotel) a position which he held until 2001. For the last few years, he has taken a back seat in Ireland’s dance scene but still plays about four gigs a year, most recently in Tripod at the end of November 2009.